From the early days of electrically powered railroad trains, there has been a desire to automate the task of driving trains in order to improve efficiency and reliability. The substantial advances in microprocessor and software technology during recent years now make it feasible to implement such systems. While it may not be possible or desirable to completely eliminate a human train driver, an Automatic Drive System can greatly aid the driver to perform his job reliably. 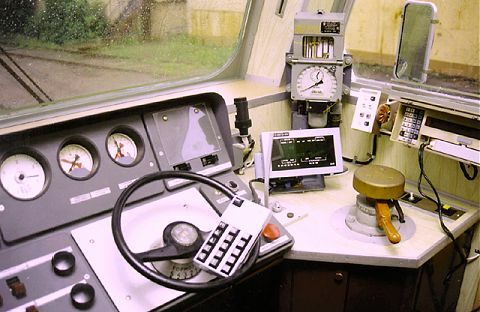 In order to meet this demand, the All-Russian Research Institute for Railway Transport (VNIIZhT) has developed the Train Automatic Drive System (TADS) for local trains. The system's architecture and design accommodates future requirements of similar systems for cargo and long-distance trains, which have many features in common with local trains. TADS has two main tasks: automatic maintenance of the calculated optimal speed, and precise braking within the required distance. In addition to these, the central tasks of efficient power management and safe railway traffic control for long-distance cargo trains, passenger trains, and local suburb trains are addressed. For future versions, additional features are planned, e.g., the automation of rolling stock. In Russia, the operating environment for the TADS hardware is quite demanding. The equipment has to operate faultlessly in the subtropical climates of Middle Asia, as well as the Arctic regions of Siberia and the Far East, with the corresponding variations in temperature, humidity, etc. The system constantly has to endure strong vibrations and heavy electrical noise generated by the high-powered locomotive drive circuits. 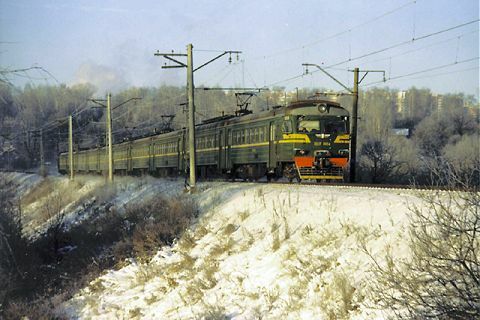 Local trains in Russia are not powered by locomotives; instead, half of the carriages have electric engines. This allows them to quickly accelerate repeatedly over small distances (about 1.5 to 2 kilometres). Other characteristics of local trains are frequent stops and the need to follow precise schedules, to be followed with an accuracy of up to 30 seconds. notification services for the train operator about specific features of each part of the route, e.g. speed limits, etc. TADS has been deployed in about 1200 local trains. It is based on the MicroPC 6030 PLC from Octagon Systems Corporation, USA. VNIIZhT has developed a standardized software application used on all trains. It includes a real-time module featuring a range of low-level drivers, which directly control the hardware of each system, and a data processing module running in the background in order not to degrade real-time performance through lower priority processing chores. In each cycle of the TADS main control loop, the following tasks are performed in real-time: interrogation of sensors, information processing, information analysis, making decisions, generating control signals. Since the amount of on-board calculations is rather small and early versions did not implement event-driven real-time features, the program employs simple round-robin scheduling and runs under MS-DOS. For the current generation of TADS, the system's hardware and software was enhanced for use on cargo and passenger locomotives, using a CPU686 CPU board from Fastwel Inc., Russia. 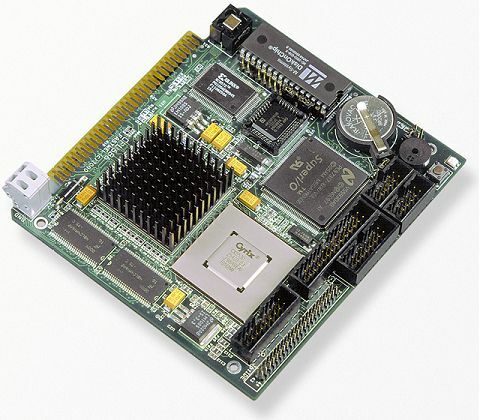 The board has the MicroPC format, the same operating specifications as the 6030 PLC, a Pentium 166 MHz GXLV CPU, 32 MB of DRAM, a 16 MB DiskOnChip flash disk, 2 serial ports, an EPP parallel port, onboard SVGA graphics, DIE and FDD controllers, and PC/104 or ISA-8 bus connections. It provides the processing power required to calculate an optimized train velocity curve. In addition, the board's power comsumption is 30% lower than that of other, comparable boards, reducing cooling problems. minimum cost of run-time royalties. QNX, VxWorks/Tornado, OS-9, and Windows CE were selected as candidates, although Windows CE is not a true real-time operating system. QNX is the most widely used of the RTOSs listed here; however, it was found that its UNIX-like interface was not suited for porting and testing the route-optimizing program. The cost of more than $10,000 for QNX and the need to pay run-time royalties for each copy of the application installed on a locomotive finally precluded deployment. The same considerations applied to VxWorks and OS-9 systems. It was considered unwise to use Windows CE as an RTOS in a critical application. In addition, Windows CE also suffers from all of the abovementioned deficiencies. After thorough market research, On Time RTOS-32 from On Time Informatik GmbH, Germany, supplied by Prosoft Ltd., Moscow, was selected. This RTOS supports the basic Win32 API functions, FAT16 and FAT32 file systems, flash memory, and - most importantly - can load and execute Win32 .EXE and .DLL files. Moreover, On Time RTOS-32 has a number of advantages, such as prioritized tasks, inter-task communication, interrupt handling, full access to the hardware, etc. If required, a graphics library with a Windows look-and-feel is also available. The authors find On Time RTOS-32 very cost effective. Its price is comparatively low and On Time do not charge run-time royalties for application copies on each locomotive. The reliability of the system is has been proven in a number of critical applications, e.g. in Ratan aircraft. Application development was significantly simplified by sample programs delivered with On Time RTOS-32 that were used to lay out the general program framework for TADS. Currently, twenty ChS7 cargo passenger locomotives are equipped with the new version of TADS, implemented on Fastwel CPU686 boards running under On Time RTOS-32. These locomotives serve the Moscow - Vyazma (243 Km) and Moscow - Sukhinichi (261 Km) railway routes. The onboard program provides optimized route calculation and minimizes the locomotives' power consumption. TADS implementation has reduced the whole power consumption by 3% to 18% (as compared to a target of 5%). The power savings have been verified by test measurements. More than 1200 local trains are also using the system. Maintenance costs of the railways have been reduced by 10% to 12%; unscheduled braking incidents have been reduced by 10% to 15% thanks to precise schedule observance. By preliminary assessment, the system has achieved savings of about $8 million in the year 2000.